A presentation I gave at the IEHA Food Safety Conference in Elgin IL on August 28, 2008 on the causes of Diarrhea on the cellular level. Here is the PowerPoint presentation for the Blogging 101 session at the National Environmental Health Association AEC in Tucson AZ. For audio go to the podcast post on this blog. This uses the SlideShare.com service as a way of posting PowerPoint to web sites and blogs. Welcome to the blog for the National Environmental Health Association 2008 Annual Education Conference and Exposition Blogging 101 session on Sunday June 22nd at 1:00 as a Learning laboratory session . We are here to give you news updates and conversation regarding the Tucson Arizona meeting, on June 22-25 2008 related to blogging. General Information can be found at the NEHA website at http://www.neha.org/AEC/2008/index.html or you can download a brochure by clicking on the picture. On this site we will be experimenting with how to blog during the Blogging 101 session. 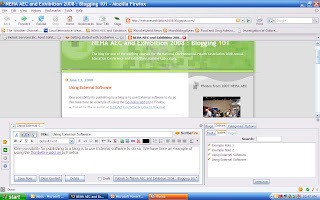 As one assignment participants can will be post to this blog of thier experiences at NEHA AEC 2008. After Tucson, we will making this the place to discuss and promote Environmental Health blogging.